A lot of Seattleites, especially on Capitol Hill, had things to be happy about during the last week of June. The gay-marriage cause, for which a lot of people here worked very hard this past year, received a big boost from the U.S. Supreme Court — just in time for Pride weekend. But folks on the Hill and all over town still had a sad occasion that week: The Egyptian Theater on East Pine Street closed after 33 years of screenings, including most of the main shows of the Seattle International Film Festival (SIFF). The Seattle Masonic Temple opened in 1915. By the 1970s, its big auditorium was regularly used for pro-wrestling events and occasional indie rock shows. In late 1975, Daryl McDonald and Dan Ireland leased The Moore Theatre downtown and renamed it the “Moore Egyptian.” (There had been a previous Egyptian Theater in the University District, which has nothing to do with this story.) That’s where McDonald and Ireland staged the first SIFF in May 1976, with a short program of 18 screenings. Four years later, McDonald and Ireland leased the Masonic auditorium and re-christened it the new Egyptian. The Moore got new operators, who returned it to hosting live concerts and stage shows. SIFF used both rooms for a couple of years, then made the Egyptian its permanent annual home base. 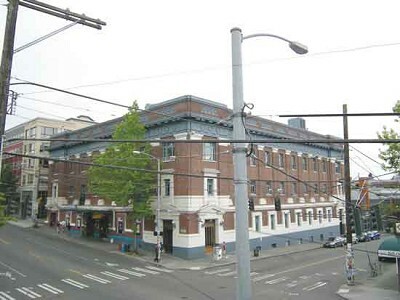 The Masons sold the building to Seattle Central Community College (SCCC) in the mid-1980s. SCCC used the building’s non-auditorium areas for its (also now-ended) film and video program and for assorted offices. After a few years, the Egyptian became part of the Seven Gables chain, founded by local art-house tycoon Raindy Finley. He sold his theaters in the mid-’80s, and they later went into the national Landmark chain, which, in turn, was eventually bought by Dallas entrepreneur Mark Cuban. SIFF, now an independent nonprofit outfit, continued to rent out the Egyptian as its main venue for three and a half weeks each year. Meanwhile, the economics of film exhibition got steadily sourer. The Internet, that great disruptor of all media, played a part. While the Egyptian was usually full or near-full during SIFF screenings, its 600 seats steadily became more difficult to fill during the other 48 weeks. Once this year’s SIFF ended, Landmark quietly told SCCC it wouldn’t keep leasing the space. The building’s not going away, unlike so many other Pike/Pine landmarks in recent years. SCCC has fielded applicants to take over the auditorium but hasn’t announced any new tenant. SIFF has recently returned to running its own year-round theaters. Would — or could — SIFF add the Egyptian back into its full-time fold? If SIFF or anyone else wanted to use it for movies, they’d have to get one of those costly digital-cinema-projection setups the Hollywood distributors now require and which have been the focus of “save our theater” fund drives here (Central Cinema, Northwest Film Forum) and elsewhere. Landmark removed the Egyptian’s digital setup, for reinstallation at one of its other properties. But, pending any revival as a single-screen cinema, it’s safe to say the Egyptian tradition ends today. It’s not the last link to Seattle’s ‘70s and ’80s funky art-house aesthetic; the Harvard Exit, Grand Illusion, Guild 45th, and Seven Gables are still with us. But it’s still a loss. SIFF/Egyptian co-founder Ireland (now a Hollywood producer-director) issued this statement: “This is the theater that Darryl and Dan built. To know it closed today broke my heart. The world-famous Egyptian. Home of the Seattle International Film Festival. Home of the Seattle and world premieres of ‘Risky Business,’ ‘Kiss of the Spider Woman,’ ‘Choose Me,’ ‘Ran,’ ‘The Road Warrior,’ ‘The Fourth Man,’ ‘The Whole Wide World’ [Ireland’s directoral debut] and many, many more. “I’m praying for a Christmas miracle in July. And I’m not telling anyone just in case it happens. Join me in my prayer: ‘Dear God, please save the world-famous Egyptian Theater and don’t turn it into another boring bank or apartment complex,’” he said. CLARK HUMPHREY is the author of “Walking Seattle” and “Vanishing Seattle.” He also writes a blog at miscmedia.com. To comment on this column, write to CityLivingEditor@nwlink.com.